We understand that cat litter boxes are ugly and unpleasant to deal with but are a necessary and important household item. It was our mission to change all that with TechKlo. Through every step of our journey, weve held your needs at the core of everything weve done; obsessing over every element and functional detail while exercising great care and consideration with each aspect of our product development, to ensure weve created the very best Self Clean litter box. Limited edition product is produced by using 100% wood material. You can order the design and color suitable for the furniture that you use in your home. Limited edition is produced specially for limited number of customers. Techklo is the most practical cat toilet in the world, why? You can personalize TechKlo setting by installing Techklo application on your Smartphone. For the garbage can, you can use the garbage bags available in your home. Sand change has never been so easy and hygienic within 1 min. It cleans the bad odor inside by filtering it with its ventilation system. There is plenty of space for your cat to be comfortable inside. Even the smallest particles in the lumpy sand get chucked out in the garbage can by being sifted and the sand remains constantly clean. There is no possibility of harming your cat. Its electric consumption is A +++. It can be operated with external battery. The product is sent to you ready-to-use. Do not forget to look at the simple instructions guide. We've made the litter box larger to accommodate bigger cats. We've kept the design low enough for older & baby cats who may have difficulty getting in and out of taller boxes. What is the ventilation system? There are 2 ventilation channels in it and a ventilator at the exit of these channels. In the ventilation system, the ventilator draws the bad odor inside, which occurs after your cat does its toilet, through the air channels and it filters the air inside by filtering through the special odor filter and prevents the bad smell from getting out. THE BRLLANCE OF SMPLCTY : TECHNOLOGY + DESGN + EASE. A pleasing object, one that is part of your daily life, makes a huge impact in how you feel and interact with that item. Everyday items such as phones, vacuum cleaners and even our thermostats, have become incredibly sleek and thoughtfully designed objects. 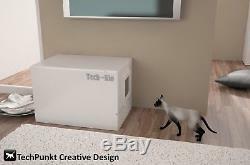 With TechKlo, we wanted something that was actually pleasing to look at; a litter box design that we are happy to have in our home. It's functional and maintains a simplicity of design that ensures years of reliable use. 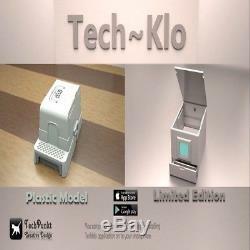 The item "TechKlo -Limited Edition Self Clean Litter Box The Best of World" is in sale since Monday, October 16, 2017. This item is in the category "Pet Supplies\Cat Supplies\Litter Boxes". The seller is "nooxxi" and is located in Schweinfurt.